I've really been into Finger Paints collections lately, I think that they undeniably improved formula wise but also treated us with some seriously amazing colors. Merry & Bright is their new Holiday Collection and the least I could say is that some colors aren't exactly what I would have expected for the season... Let's see if that is in a good way! 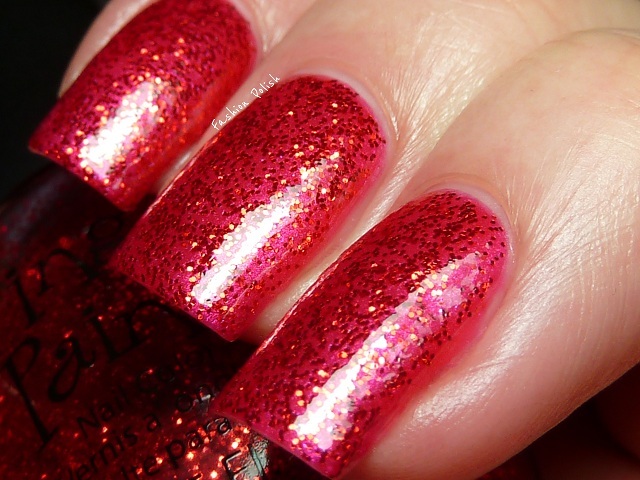 Yule Be Merry is a bright and hot blue based pink shimmer in a red hued base. It's not very unique but perfectly well formulated. I used 2 coats below and believe me this is not a pink that will go unnoticed. Santa Kisses is typically your average red glitter. Small round red particles in a clear base... Only these are hex and apply smoothly and evenly. If don't own any red glitter yet, which you totally should for the Holiday season, you might want to consider this one. This is 1 coat over Yule be Merry plus topcoat. Winter Sky is exactly what I meant by unexpected Holiday season colors. I think I would have pictured this bold turquoisy-blue shimmer as part of a Summer collection but definitely not for Christmas... Like that would prevent me from wearing it! ;-) Formula was very good too, perfectly opaque in two coats, very rich and pigmented. Beware of stained nails with this one, you might want to double up basecoat. Drummer Boy is Santa Kisses brother : small blue hex glitter in a clear base, easily manageable and even application. The only difference, apart from the color obviously, is the amount of glitter, this is less dense. In the pictures below, one coat over Winter Sky and topcoat. Comet's Collar is the color I was the most excited about from the Press Release and it's actually the one I prefer from the collection. 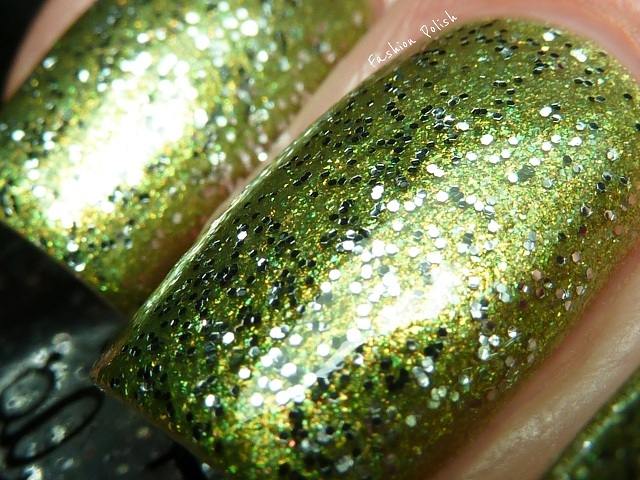 Again, not exactly what I'd anticipate for the Holiday but it definitely is a festive color : a very complex mix of different greens, gold and copper shimmer flecks in a yellow based green, for an overall super sparkly finish. It did require 3 coats but they dried quite fast so I didn't mind at all. Frosty night is the last glitter of the collection. As you've probably guessed by now, it's made of small hex silver glitters in a clear base, tpo. It has the same amount of glitter as Drummer Boy so I doubt one could achieve opacity with it but it could make a very good layering polish. Here it is, one coat, over Comet's Collar, with topcoat. Finger Paints released a very nice, out of the box, Holiday Collection this year. I am definitely in love with Winter Sky and Comet's Collar, I do like Yule be Merry too for its boldness and as for the 3 glitters, I think they would make great layering polishes or even better perfect glitter gradients. Did you get any of them? Finger Paints products are available at Sally Beauty and retail for $4,99 each. The glitters add a nice touch. I'm in love with Winter Sky also. Such a beautiful color! I have a lighter version of comet's collar - it's a more yellowish green - but it has that same fab color - good to see they have a darker green out and I'll definitely have to pick these up and soon! can't get over how perfect your nails and cuticles are!! Amazing, I love them All ! That Winter Sky is stunning! I just love your nails!! I love Winter Sky and Comet's Collar! I hope I can still get these, my Sally's always gets picked over fast! ¡Qué esmaltes más bonitos! Y me encantan tus uñas. I love the Winter Sky/Drummer Boy combination and Yule Be Merry is super pretty, too! Your swatches are so gorgeous!